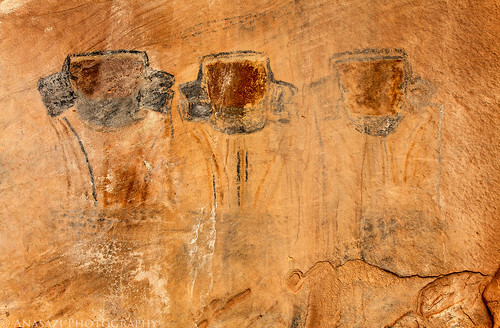 We sure did see a lot of ‘faces’ pictographs last weekend in Canyonlands National Park. Besides the Thirteen Faces and Nine Faces panels, we also found the Eleven Faces. While there may have been Eleven Faces in this panel at one point in time, eight of them are really still visible. The three figures in the photo above were the three rightmost faces in the panel. Unfortunately, calcite has been leaching from the sandstone that these pictographs were painted on, so much of it has been covered in the white substance, making it difficult to photograph. I did my best to bring out the details in this photo.